The Word is Life | Ep 91 - Are You Listening? You Can’t Share what You Don’t Have | Ep 90 - Are You Listening? Are You Evangelism Ready? | Ep 89 - Are You Listening? Why Do We Care About Doctrine? | Ep 88 - Are You Listening? 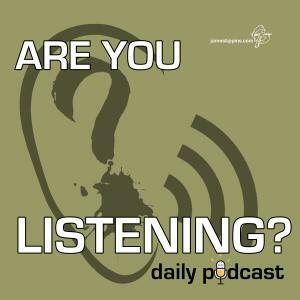 Confronting Sin | Ep 87 - Are You Listening? Clarifying Love | Ep 86 - Are You Listening? Calling Out Error | Ep 85 - Are You Listening? Forgiving Others? | Ep 84 - Are You Listening? Conflict | Ep 83 - Are You Listening? Worry & Fear | Ep 82 - Are You Listening?